This article is a brief survey-mainly of a descriptive character-of the extensive research during five decades of Ake Hultkrantz in the field of shamanism. The following pages can hopefully serve as an introductory guide to this research. The attention is concentrated to four principally important questions, first of all the geographical and definitional aspects of the concepts shamanism and trance. The religio-ecological approach to religion and shamanism is presented and further the interpretation of the indigenous Saami shamanism. Finally attention is paid to Ake Hultkrantz’s view of contemporary urban shamanism. LOUISE BÄCKMAN (Stockholm): The Noaidi and his Worldview: A Study of Saami Shamanism from An Historical Point of View. The article considers the changing status of the noaidi, or Saami shaman, over historical time. It is obvious that, at the beginning of the historical period, the noaidi was the religious specialist among the Saami. This means that he (all sources see the noaidi as a man) was familiar with “the realm of the divine” through his experiences of the spiritual world. Although the Saami had contacts with neighboring peoples, including non-Saami Scandinavians, that influenced their view of the noaidi, their religion as a whole did not change and the noaidi remained the specialist in religious matters during this early period. At the end of the 12th century, however, a new factor threatened the noaidi’s authority-Christianity. The Christian missionaries worked to convince the Saami that they, not the noaidi, were the bearers of divine truth, but it was 600 years before their efforts achieved complete success. During this time the noaidi gradually lost his role as the religious specialist and his status was degraded to that of a wizard and juggler. Although Burmese spirit mediumship is flourishing, developing and changing, it has not received much scholarly attention. The ceremonies, the nat pwes, are performances by Buddhists for Buddhists in which music, singing, dancing and acting are important and necessary elements. In Burmese religion there are not only monks and mediums, but also weikzas and bodaws, i.e. wizards, magicians, alchemists and wise men. The most venerated weikzas, although believed to have already entered an invisible world, may be present at nat pwes, inspiring and even possessing participants, and charismatic bodaws may act as mediums and dancers. In Burma there is thus a close interaction between the shamanic, the occult and the normative Buddhism. After decades of fieldwork, the author is certain that sacrificial ritual plays an important role in the practice of shamans. It can be said that the sacrifice makes the whole ritual event sacred. The other focus of the present article is the problem of trance, the reality of which has been called into question recently. The article presents an eyewitness account of shamanic trance which indicates that it is a necessary part of the whole ritual, at least among the Daurs of Inner Mongolia, Northeast China. In 2003 we filmed a healing ritual in a small village where a Daur and an Evenki shamaness, working together, went into trance several times. Trance is necessary to communicate with the spirits. Furthermore, the trance indicates to participants that the spirit helpers have indeed appeared and that there is hope of recovery for the patient. At this point the gates are open to spiritual experience. Focus here is on one of the most interesting ceremonial objects used by Siberian and North American shamans: shaman dolls. Although names for this phenomenon differ among particular cultures, intriguing resemblances are found among Navajo, North Athabaskan and Ket wooden figurines in physical image, symbolism, and function. Their generalized function could be characterized as established for the Navajo figurines “communicative offerings with the power of exorcism” (Kelly et al. 1972: 14). The tradition of the shaman doll as guardian, helper, and healer is realized in different forms that could be linked together as cultural typology of the North, or even possibly as an ancient universal feature. This paper explores the multiple aspects of soul that Hultkrantz has depicted, using the example of a Gitxsan Elder who is noted as returned multiply while also helping her relatives from her spiritual abode; and it also presents compelling examples of contemporary rebirth from the Chipewyn peoples (by Connie Matchatis); and from the Kitkatla Tsimshian (by Georgina Hill). The Chipewyn examples include shamanistic healing. The Tsimshian example relates to the inverse of the Orpheus tradition; rather than being unable to bring back a deceased wife from the under or netherworld, the Elder plans his future parents before expiring and being reborn. This paper describes the phenomena by which shamanic power can be recognized, and something of the nature of the world in which the power makes play. It acts as actual connectivity, as an extension between people, which we feel as a second way of being social, like Victor Turner’s communitas. We are collectively conscious of it in a dim way. It is the collective psyche, which appears to be operating at every turn, just as both sides of our brain operate at every turn. It seems to be an endowment with which we were born. And as such, it is very much the subject for serious ethnographic exploration. If we wish to study the “original” or, conversely, the “artificial” expressions of shamanism-as Hultkrantz (2003) has suggested-we in fact find ourselves dealing frequently with “foreign” or, more formally, “interregional” elements. In my paper I stress the fact that the absorption of foreign elements is a very common phenomenon in all religions. I list first some cases of interpretatio externa concerning shamanism, and then of the use of foreign terms in shamanism. Drums and flying can be explained not only in shamanism, but also, for example, in medieval high music in Europe inspired by the Crusades by reference to Karl May’s enthusiasm for the Zeppelin balloon as a means of ecstatic flying. Early Central Asian sources (see Sukhareva 1940) show a wide variety of “foreign” terms in folk beliefs, which have been interpreted (e.g. 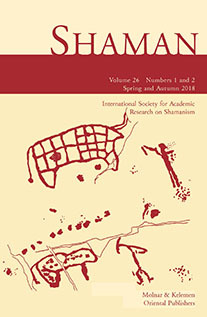 Snesarev 1969) as “relics of shamanism.” Without presenting an exhaustive catalogue of such elements, the task of my paper is to call the attention of future scholars to the need to apply the methods of comparative religion to such phenomena in shamanism just as they are in other subject areas. As with Indigenous Peoples everywhere, Siberians define their future in terms of their traditions. The Indigenous Peoples of Russia identify music as central to their identities as distinct nations and ethnic minorities within the new Russian Federation. Music asserts their collective identity as Native Peoples in relation to the dominant Russian ideology and culture and as minority peoples in the global context. The expression, preservation, and revitalization of a diverse but unifying musical heritage are seen as key to sustainable cultural, economic and political development in Sakha today. The traditional circle dance of the Manchu-Tunguz Peoples of Sakha as well as Sakha’s High Music School and Jew’s Harp Museum are discussed in relation to these themes. The theoretical and methodological implications are explored through definition of the concept “enic” to suggest new ways of researching indigenous music which can inform the social sciences generally. Representing Tuurngait. Edited by Frédéric Laugrand, Jarich Oosten and FranÃ§ois Trudel and participating elders and students. Memory and History in Nunavut. Vol. 1.